An extra special Halloween gift. from top to bottom with ghost lying flat. RND 1: Ch 3, 11 hdc in 3rd ch from hk. Join with sl st in top of beg ch 3. Ch 1, Do Not Turn. RND 2: 2 sc in each st around. Do not join, place marker and begin working in continuous rounds. RND 3: Sc in each st, reposition marker. Do Not Turn. RNDS 4-10: Rep Rnd 3. RND 11: Sc dec over next 2 sts, around. Reposition Marker. Do Not Turn. RND 12: 3 sc in each st. Reposition Marker. Do Not Turn. RND 13: 2 sc in each st. Reposition Marker. Do Not Turn. RNDS 14-27: Sc in each sc. Reposition Marker. Do Not Turn. After Rnd 27, sl st in next st.
Thread the yarn needle with about 16" of black yarn and stitch on a face. See photo for example. Weave the black yarn in and out at the neck between Rnds 11 and 12. Turn ghost over and insert 2-3 of the snack size candy bars (I used Snickers) or any type of candy you want into the ghost's head. Now draw the black yarn snug so the candy doesn't fall out and tie a bow. 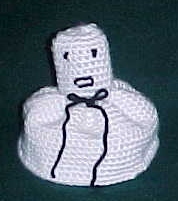 NOTE: If you crochet fairly tightly your ghost is very likely to be free standing. OPTIONAL: Add a black string through the top of the ghost's head it can be used as a Halloween decoration.